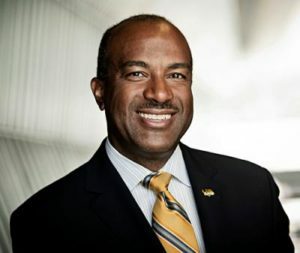 The UC Board of Regents voted unanimously on Feb. 23 to select Gary May as the seventh UC Davis chancellor to replace former Chancellor Linda Katehi, who resigned in August 2016. The regents confirmed May, dean of Georgia Tech’s College of Engineering, last Thursday from a national search of more than 500 potential candidates. He has worked at Georgia Tech for about three decades, most recently as dean. But as a UC Berkeley alumnus, May is familiar with the UC system. He earned his electrical engineering and computer science master’s in 1988, then a doctorate in 1991. May was a co-creator and co-director of Facilitating Academic Careers in Engineering and Science (FACES), which helped over 400 underrepresented students receive doctorates in science or engineering. “He’s the right person to guide UC Davis to even greater heights, advancing academic and research initiatives [and] building a stronger community with students, faculty and staff,” said UC President Janet Napolitano in a Feb. 21 press release. The new chancellor will help UC Davis recuperate from Katehi’s misconduct which included paying consultants at least $175,000 to hide search results of a 2011 incident in which a former UC Davis police officer pepper-sprayed student demonstrators. UC Davis’s interim Chancellor Ralph Hexter will continue to serve until May begins his term on Aug. 1. Once he assumes his chancellorship, May will earn $495,000 annually, including $75,000 in faculty chairman funds from a private endowment, according to UC records. The UC regents stressed in last Thursday’s meeting that May’s base salary is $4,000 less than Katehi’s, but he will be the fourth highest paid UC chancellor just from base salary alone. May is expected to earn $325,780 a year at UC Davis from sitting on outside boards, according to The Sacramento Bee. May serves as a board member of Virginia-based defense and technology company and a non-profit research facility in defense, technology and medicine. Linda Katehi previously held board positions at both Devry Education Group and a textbook publisher, which sparked criticism for a conflict of interest of profiting from certain students. Since Katehi’s investigation and resignation, the UC regents imposed a restriction to limit the amount of outside paid positions a chancellor may hold only two. They mandated that they be reviewed and approved to ensure the positions do not create a conflict of interest or a “reputational risk” to the university system. May will have to abide by these restrictions, and has stated that he does not intend to take on any more positions as UC Davis chancellor. The UC regents reiterated these rules while nominating him for the chancellor position but believed he is the right person to lead the UC Davis campus. “Gary May is a dynamic leader and an accomplished scholar and engineer with a passion for helping others succeed,” said Napolitano in press release. May said in the Feb. 21 press release that early in his career the lack of women and people of color in academic space concerned him. Previous articleWhat’s Next, Santa Cruz?